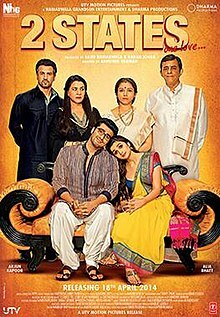 The Hindi movie 2 States is about the North-South Chemistry between 2 intelligent IIM Ahmedabad MBA Students- Punjab-da-Puttar- Krish Malhotra (Arjun Kapoor) of Delhi & Ananya Swaminathan (Alia Bhatt), a lover of non-veg food & Beer though belonging to a strictly-vegetarian Tamilian Brahmin family of Chennai. It is about the Locha-E-Ulfat (Problem of Love) that happens when Krish & Ananya meet. Before anyone says Offo, the duo bond together becoming Mast Magan (Crazily involved) at campus and beyond. Their love is strong, but has to pass many tests. Marriage is no cakewalk for the lovers… Hero takes up a job in the heroine's city. They make unsuccessful efforts to ensure their family's bonding. They discuss running away. The hero contemplates suicide. The otherwise strong heroine breaks down in tears. The happy ending is a hard-earned victory as finally there’s celebration between this marriage of two 'broadminded' families. Awesome award-worthy performances by all the cast- Krish Malhotra- Arjun, Ananya Swaminathan-Alia, Mrs & Mr Malhotra-Amrita Singh & Ronit Roy, Mrs & Mr. Swaminathan- Revathi & Shiv Subramaniam, and all the supporting cast, including extended family and friends! The lead actors stand out for their fresh vibes & credible acting. Both Arjun & Alia have portrayed a remarkable range of emotions- unique blend of vulnerability, sensuality & strength with a great screen presence, sure to win them accolades & fans. Director Abhishek Varman has done an excellent job. Remo D'Souza's choreography to Shankar Ehsan Loy’s groovy music is super. Kudos to everyone associated with the movie! As Chetan Bhagat too was a part of the movie-making process, the movie sticks to the book. Though the movie is more than 2 hours long, yet time-constraints have ensured that the movie is an abridged version of the book. I missed the interesting character Dolly from the book, who has just got a mention in the movie! In fact, even some scenes shown in the trailers on TV (like the lovers discussing Pyaar ka Bomb, Mr. Swaminathan dressing up Krish, Krish mentioning that he had been 'checked out' by Ananya, Krish's Mom asking about the eligible Punjabi girls etc), have not been included in the movie. Perhaps they will be added later to draw the public to re-watch? Hope the Producers- Karan Johar & Sajid Nadiadwala include them soon! Watch 2 States & embark on a roller-coaster ride of love, drama, emotions, tears, fears…and finally cheers! Good review. But whatever I dislike going to halls and seeing movies, I wish to see it at home. Hope they show it on TV soon. Being a Movie-fan, I love the theatre-experience! I guess you have to wait extra long for this movie! Hits take more time to be shown on TV! Nice review.. I watched it using those BA Book My Show vouchers..:-P..
Do watch. However, you need to check whether the tickets are available. Showing Housefull here even for tomorrow's shows! Booked it on 16th, Dear. Thanks Meera :) Book immediately. Weekend shows are mostly sold out! Like Indrani I too will wait for it to come home on the TV. Hehe I don't know why I just dont have the patience to go the movie theatre and watch it. I'll be lazy on the couch and wait like the others for the TV premiere! Will see it on Monday - in the theater - Indrani please note. Great Manjulika :) It was fun! Nice that you managed to book the tickets- huge Queues & disappointment for many here as shows were sold out! Very nice review! I have enjoyed the book , and now hope to enjoy the movie! Totally agree with your conservative point of view. Though it is true that movies are inspired by real life incidences, sometimes some very good movies show some incidences/scenes that I feel uncomfortable watching them with kids! Kids are much aware than their parents. signs of changing times. Delighted that you find my review tempting, Preethi! Sholay gets 5 star rating and is remembered after 40 yrs. Will people remember 2 States after even 5 months? May be the quality of bollywood is so pathetic these days that an above average movie like this gets 4.5 rating! Dear Anonymous, first I do wish you would present your views without being anonymous. I loved the movie hence I rated it 4.5. In fact, I interviewed a couple of people about what they'd rate the movie after watching the 1st Day 1st Show (when the critics hadn't yet announced their ratings). Yes, people will remember the movie as it's associated with the book & the true story of the famous author. Yes Rakesh, the movie is totally based on the book barring minor changes & deletions. I felt the songs have similar energy as those of 3 Idiots. Will check out your review. Nice review ! I liked the movie also. I loved the use of Tamil in many places, whereas generally people talk the language of the film irrespective of where the film is based on. Here is again the stereotype bollywood. Why a south Indian girl or boy in Hindi movie has to be a Tamil speaking person from Chennai? Does bollywood think that Chennai is capital of whole south India and Tamil is the only language spoken? Why not a kannada speaking girl from Bangalore or a Telagu speaking boy from Hyderabad? I would never watch such stereotyped cross culture Hindi movies. Neha, This movie has been based on Chetan Bhagat's true life-story that's in his novel of the same name. If a Tamil-speaking girl is the heroine, it's because the author's wife is also a Tamilian. Nothing stereotyped. Bollywood movies have shown the North & South & other such divides in India being bridged. Another movie 'Chennai Express' also had the heroine based from the South. I feel all these are good signs as the morals of these movies are that we are Indians first & that love triumphs over all differences. These augur well for broadening mindsets & for national integration. Am sure film-makers will soon explore the other Southern states :) Do watch! hi..can ssomebody please tell me where can i download the climax tamil song in the movie?? Arjun Kapur and Alia Bhatt seen awesome in 2state. I like to see this movie. Abhishek Varmar done excellent job. Combination of director Abhishek Varman, choreographer Remo D'souza's and shankar ehasan loy's music gives such a nice movie. I like to see movie again and again. I have watched it many times too!